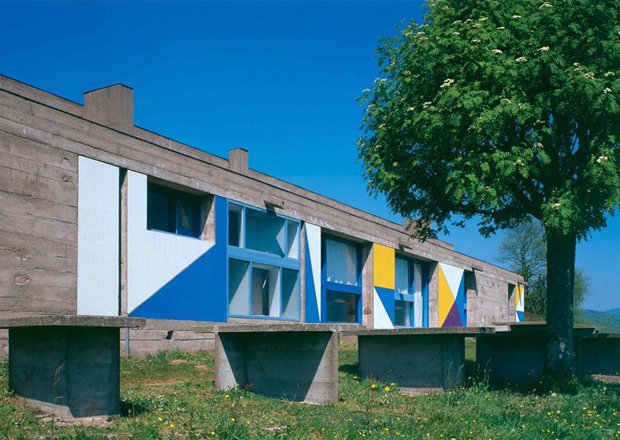 Exterior shots of the Chapelle Notre Dame du Haut taken by Paul Koslowski for Foundation Le Corbusier in 1997. 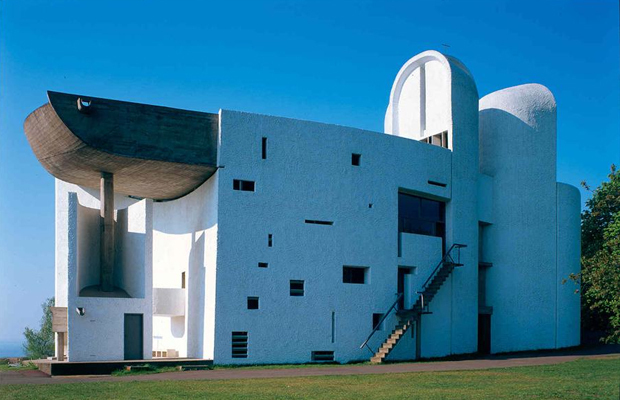 Through my own research on Tadao Ando it’s been interesting to see the link between his concrete structures and Le Corbusier’s buildings and architecture. It all made sense when I saw this chapel as it linked a lot of the elements that Tadao uses in his buildings, it also seems ironic how he has undertaken a lot of chapel projects himself, maybe there is something spiritually linked? 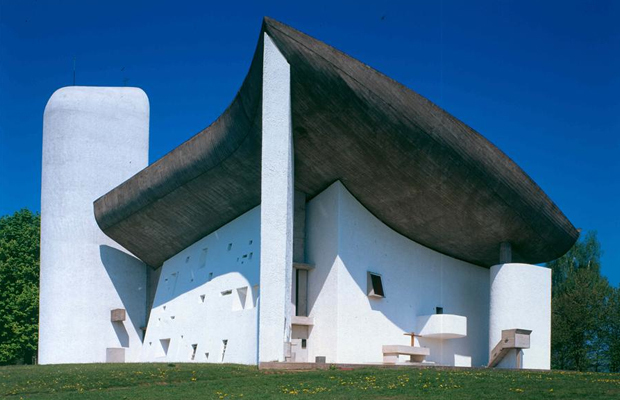 Whatever way this building designed by Le Corbusier named ‘Chapelle Notre Dame du Haut’ was constructed from 1950 through to 1955 and in my eyes is way ahead of its time. For a while now I’ve been thinking to myself about how a lot of the works that I get attracted to remind me of Pablo Picasso or Dali, it could be the shape, composition or the overall aesthetic, there always seems to be eccentric elements involved. 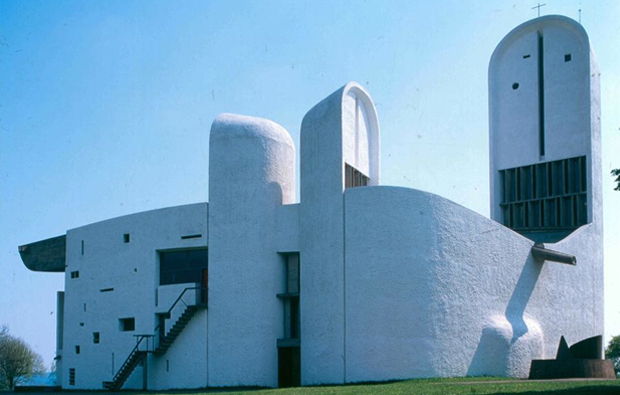 Take this building, the structure is quirky in its form, from all angles it looks different and quite playful. It’s complicated and intricate but at the same time simple on the eye, from first sight it looks more like a painting than anything and doesn’t look physically possible to build as a structure. 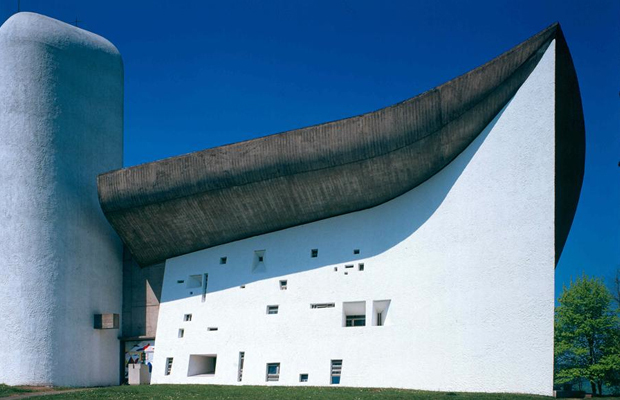 I also like the fact that Le Corbusier has left a lot of room for light, this leaves weird and interesting shadows cascading in, for example there is several centimeters left between the shell of the roof and the vertical envelope of the walls which leaves enough entry for daylight at different times of the day. 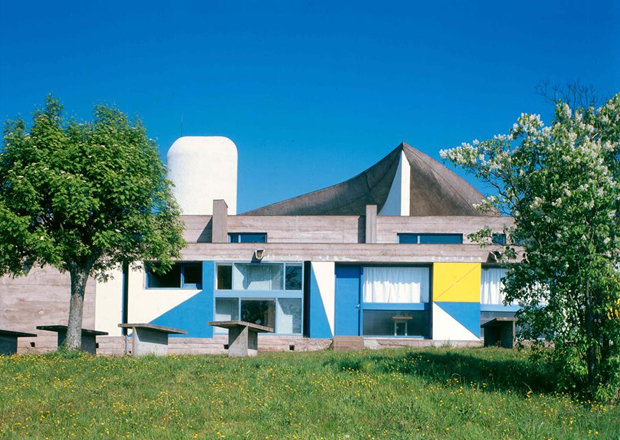 There are also openings covered with clear glass in the walls and in other places coloured glass, Le Corbusier did this so that one could “see the clouds, or the movements of the foliage and even passers-by”. Another interesting aspect is the scale of proportion, or the Modulor which was devised by the Swiss-born French architect. It’s based on the height of an English man with his arm raised and was developed as a visual bridge between two incompatible scales, the Imperial system and the Metric system. The end result was the first graphical representation of the derivation of scale, this was then used in many of his buildings such as this chapel which made it possible to use small dimensions in certain places without the visitor being aware of them. Overall a real masterpiece! I hope you appreciate this structure as much as I do, it might be worth having a look through Modulor and the whole explanation behind it, quite extraordinary.